Pull the cover off the barbie, whip out the pool toys and set up the backyard cricket, because one of the most anticipated celebrations on the Aussie events calendar is almost here! It's Australia Day in a fortnight, and however you celebrate being Australian, it's a great opportunity to get out into that brilliant southern sun, or hang out with some good company and a good lunch. Instead of the kids just lounging about like a regular public holiday, you can turn Australia day into great fun for them too. Today, we share some of our favourite ideas that we guarantee will provide a cracker day for both you and the kids. Rather than spend extra time in the kitchen finishing up this Australia Day staple, get the kids involved in the action! Divide your pavlova mix into mini mounds during the cooking process, and you'll ensure that there’s plenty of decorating fun to go around. Put together a variety of Aussie-themed toppings, like Bowen mangoes (which are in season). Blueberries and strawberries are always favourites, and patriotic red and blue MnMs, fruit purees and sprinkles will probably be popular with the little ones. Load up the mini pavs with fresh cream and let everyone's creative juices flow. 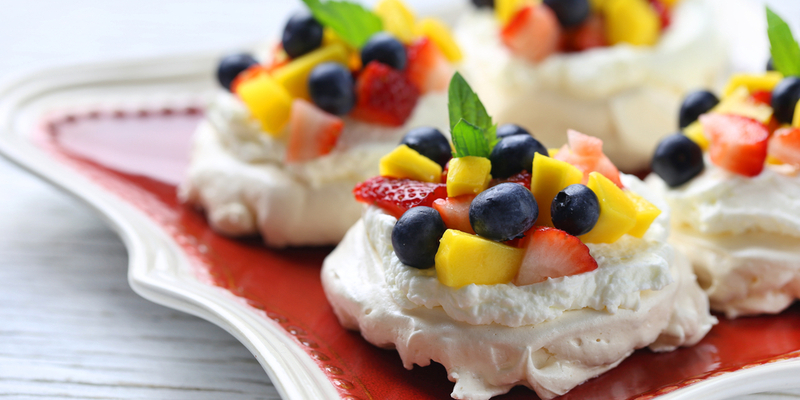 Kids will love the opportunity to turn their mini pavlova into edible art! This is a great activity to do during the downtime between your backyard cricket games. All you will need is some thick cardboard, a boomerang template, paint brushes and craft paint. Remember: parents should pre-cut the boomerang-shaped cardboard. Set up a shady arts and crafts zone on the grass, and have the kids paint their most creative designs on their cardboard boomerang. Dot painting is a great traditional option; do some research on Aboriginal art, so that you can teach the kids about it while they paint! Once the boomerangs have been left to dry during the next cricket innings, they’ll be ready for their own tossing games. We love this modern take on a traditional Aussie favourite, and your guests will too. Opt for Australia-themed cupcake paper and little toothpick flags for some extra fun. Preheat your oven the 180ºC, and line a muffin tin with cupcake papers. Whip the butter and sugar until the mixture is light and fluffy. Slowly add the eggs and vanilla, and mix well. Sift in the flour and baking powder, and gradually mix in with milk. Spoon the cupcake mixture into your muffin tin, then place it into the oven. Bake for 20 minutes, but skewer a muffin as you get close to see if they're already cooked. Remove the cupcakes from the tray, and cool them on a wire rack. Whisk the hot water, butter and cocoa until smooth. Add icing sugar, and continue to mix until combined. Tip: add more hot water to thin the mixture, or more icing sugar to thicken). Pipe or spread the icing onto the cupcakes once they've completely cooled. Sprinkle with coconut flakes and dollops of jam to finish. An Aussie twist on the classic potato sack race, our ‘Bouncing Kangaroos’ version will guarantee some laughs. 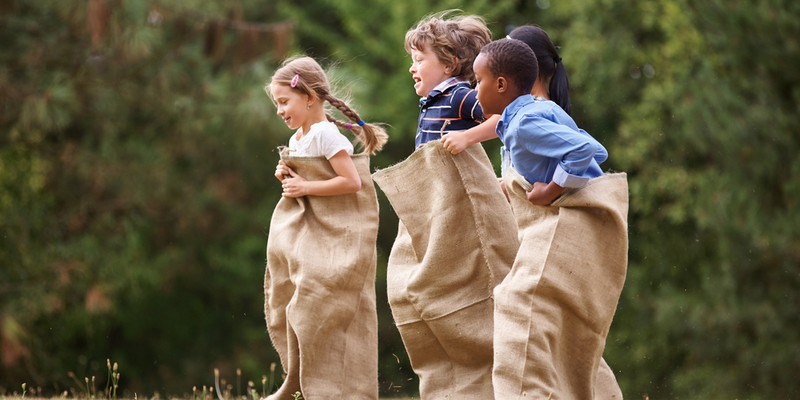 Simply find some large sacks at your local gardening supplies store and lay them out at your backyard racing start line. Competitors are only allowed to hold their sack up using two hands in front of their belly button, like kangaroo paws. If they break the kangaroo stance, they’re disqualified! We’d love to hear how you celebrate with the family on Australia Day this year. Which classic Aussie activities and snacks will feature at your event?